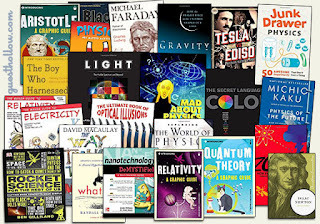 A RUP LIFE: Guest Hollow High School Physics Giveaway!! Guest Hollow High School Physics Giveaway!! As you know last year we discovered Guest Hollow and used it for Chemistry. 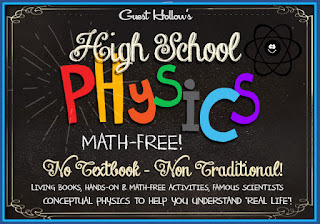 As I was planning for next school year I consulted with the two biggest critics - my boys - and they both agreed they wanted to use Guest Hollow for Physics! I'm pretty excited by this choice because they are excited and that means they will actually do the work! You will need to print out the workbook and possibly the schedule. (We choose to print it and the kids have it stored on their phones in ibooks so they can easily click on the links for the videos.) I like having it both ways because we use the printed schedule to check off completed assignments. Only speaking from our experiences last year with Chemistry, you can expect a different science year. (Unless you are already doing literature based studies.) This was one of the best years we've ever had. The kids liked that the books switched often. They loved all the practical knowledge they learned. In fact we finished school last month and they are still sharing things they learned. You'd be amazed at how many topics they covered during Chemistry and how much of it relates to every day life and current events. My husband and I are often surprised by what the boys add to our conversations. One lucky reader will win Guest Hollow's Physics Curriculum!! I'm also interested in the biology curriculum. I'm also interested in the Kitchen Chemistry curriculum. Would love to win. Trying kitchen chemistry this year. My literature loving son is excited! We used Guest Hollow Biology last year and will start Chemistry in the Kitchen in the fall. I'd love to use GH Physics next for my daughter's senior year in high school! I'm interested in the Kitchen Chemistry curriculum and the Jr. Anatomy one as well. I'm interested the Chemistry, as I have a couple who really dislike traditional science learning textbooks! As a bonus, we have some of the titles needed to use the program! I would also be interested in the Geography curriculum.